Speed scrabble is a fun, fast moving variation of the classic game of Scrabble. Our favorite East Devon Guide, Lesley, sent the instructions for this game and we hope you enjoy playing it as much as we have. If you're hosting a party where guests are not well acquainted with each other, Speed Scrabble is a great icebreaker game to get everyone talking and laughing. Warning: Don't cheat and try and pass off words with outrageous spellings... unless you think you can get away with it! April 13th is Scrabble Day. 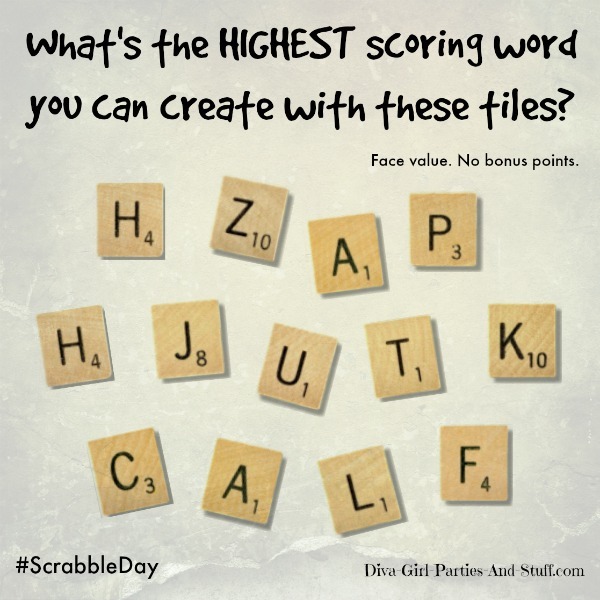 Celebrate with a round of Speed Scrabble or go all out and plan a Scrabble party. Each player starts with 7 letters. The Scrabble board is not used. The remaining letter tiles are placed in the center of the table face down. Players must make up the best words that they can from the selection of letters they start with. The first person to use all of their letters shouts GO and then everyone has to pick up another letter tile. Players are allowed to dismantle their layout and rearrange it if they can make better words. They can do this as many times as they wish. The only rule is that as soon as someone says GO all players have to pick up another tile. When playing against opponents who have a good selection of letters and who are quick at making up words, the game can get exciting very quickly, especially if there are 4 or more players. The game can also become extremely competitive because of the challenge of making up good, high scoring words quickly. When there are no more letters left to pick up, tally up each person's score minus the points on their unused tiles. Side Note: Lesley's family plays this version of Scrabble much more than the traditional one because it moves along faster and nobody gets fed up with waiting for the other players to find the best scores.